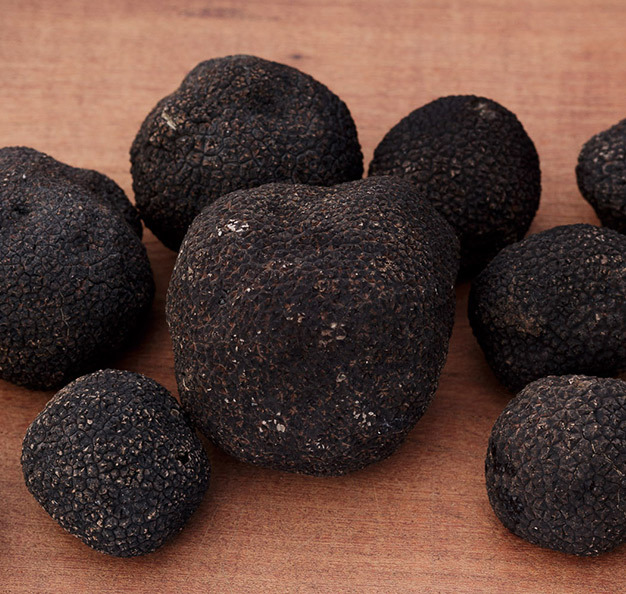 The king of black truffles and almost certainly the most exciting truffle variety for chefs. Often known as the “Périgord” truffle though rarely coming from there – most French black truffles actually come from Provence. Native in the wild to France, Spain, Italy and parts of Eastern Europe but the vast majority are now cultivated – not an easy process as it involves inoculating the roots of oak and hazel trees with truffle spore and then a long wait with an uncertain result. Spanish cultivation in particular has been a huge success and the quality is amazing. Meanwhile the French truffle industry is declining and Italian black winter truffles are usually wild and less consistent. This variety is also now cultivated in the new world – above all in Australia but other southern hemisphere countries in various stages of production include New Zealand, South Africa, Chile and Argentina. The season runs through the winter – so from late November to March in Europe and from June until August in the Southern Hemisphere. A relatively common species native to almost every country in Europe. The season runs all through the summer and the price is generally fairly low, reflecting the large volumes that are found and their less intense flavour. They have the mildest aroma of the main truffle species, especially earlier in the summer when we would not recommend using them. However they can become more interesting towards the end of the summer when the aroma and flavour start to develop. 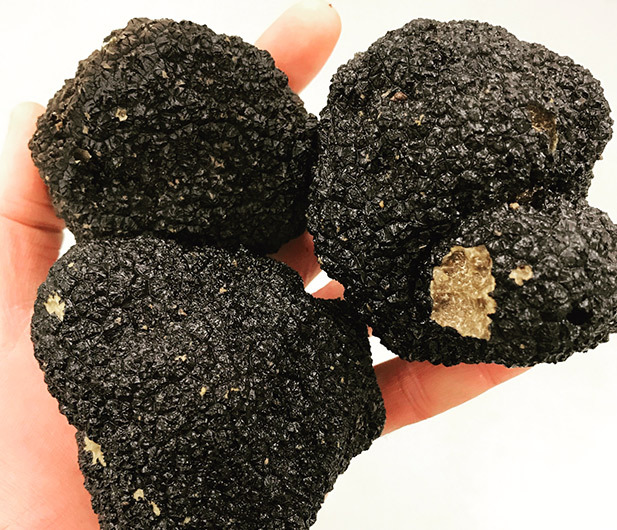 To appreciate summer truffles at their best they should be used in very generous quantities; they can then be delicious in dishes where a milder truffle is required. They can be warmed but should never be fully cooked. A very close relative to the summer truffle, identical externally but with a considerably darker internal colour as well as a much more powerful flavour and aroma. They are found in different areas to the summer truffle and have a later harvesting period. Black Autumn truffles have a delicious heady yet earthy truffle taste and work beautifully in many autumn dishes. 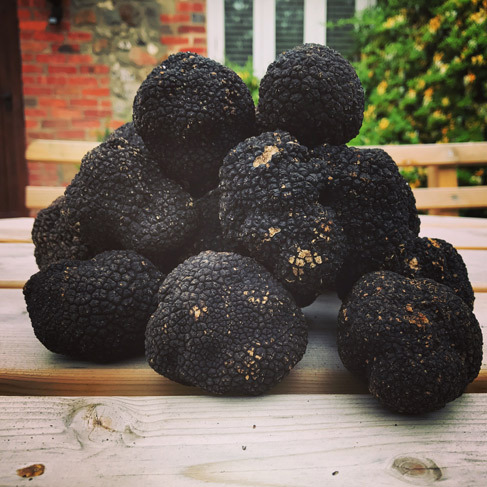 The season runs from September to January and they are sometimes known as the ‘Burgundy’ truffle. 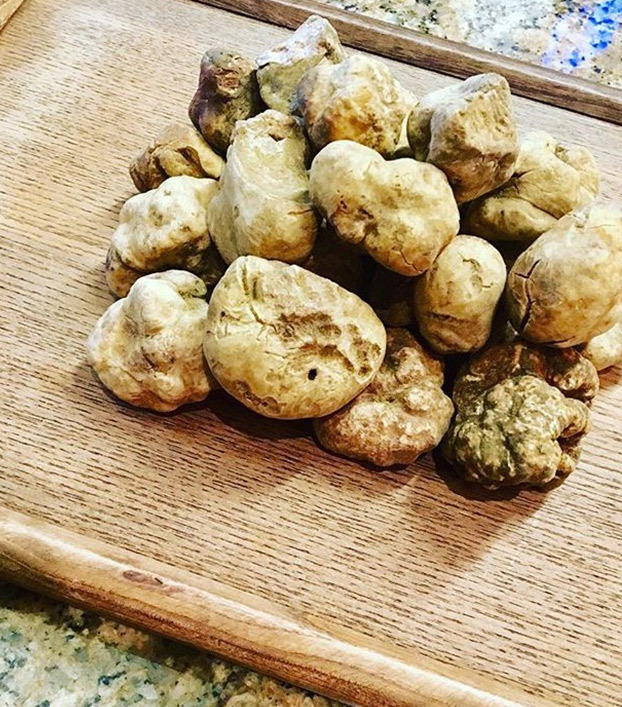 This is the variety we hunt wild in Wiltshire and we also source them from Italy – our imported truffles are noticeably different from those that we hunt in Wiltshire, but still very good. At their peak the aroma of Black Autumn truffles is fantastic and in Wiltshire it envelops the entire woodland as we hunt them. A versatile star in the kitchen, Black Autumn truffles combine beautifully with a large variety of other flavours. There is a good reason why the food world goes crazy for white truffles during their short season every Autumn – the aroma is just out of this world and worthy of all the hype and high prices. As the only species which has never been successfully cultivated, white truffles are still found in the traditional way – growing in the wild and hunted secretively by skilled experts working with dogs (never pigs). Despite the fact that they are often called “Alba” truffles, the vast majority are hunted in other parts of Italy (for example Emilia Romagna, Tuscany, Umbria, Abruzzo or Marche), in the peninsula of Istria (Croatia / Slovenia / Italy) or in other parts of Eastern Europe such as Serbia, Hungary or Romania. Many are then bought by wholesalers in Alba before being sold on around the world. White truffles must always be served raw – grated or sliced over a dish just before serving. They are usually served on simple dishes – traditionally on egg, pasta, risotto or fonduta. Their aroma is beyond compare and perhaps the nicest smell on the planet! You may be told that these truffles are similar to ‘proper’ white truffles (tuber magnatum pico) – they’re not. They are a completely different species and are certainly not interchangeable in recipes. Our season for them is short as the earliest ones have little aroma and the latest ones become very small in size and prone to insect damage. 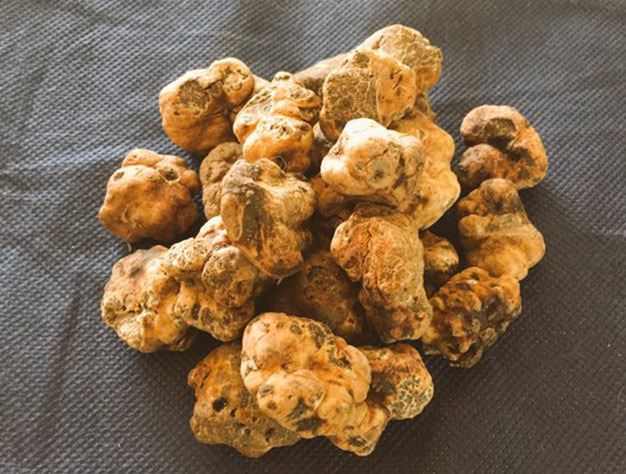 Often known as “Marzulo” (March) truffles in Italy they’re usually at their best in late February and early March. At their peak Spring White truffles can have a fairly intense and very interesting garlicky aroma that some chefs love and others hate, but we believe their unique flavour can work beautifully in certain dishes.